For in-game updates, news and more for all of the San Clemente High School sports programs, follow us on Twitter @SouthOCSports. San Clemente junior forward Ella Gardiner has reached rarefied air for the Tritons girls basketball program. Gardiner became only the eighth player in school history to score 1,000 career points for the Tritons as San Clemente downed Tesoro, 50-25, in a South Coast League game on Tuesday, Jan. 15 at San Clemente High School. Gardiner is the first to reach the milestone since Cassie Harberts in 2010. 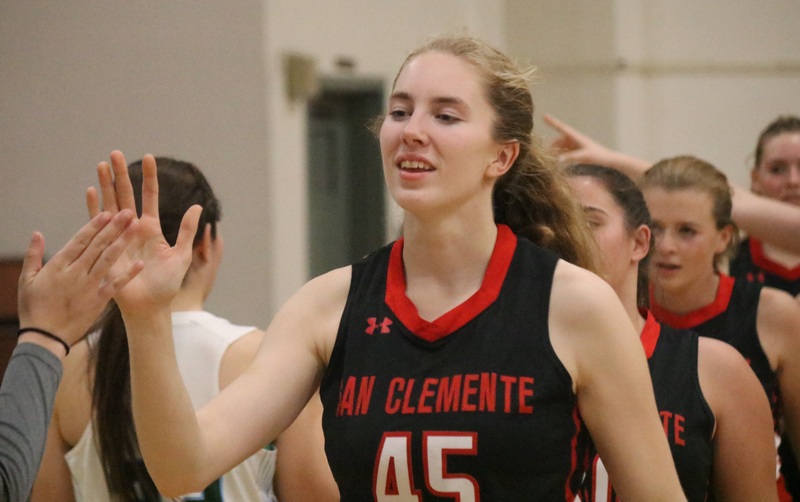 Harberts is second in school history with 1,593 points, which is nearly a full 1,000 behind San Clemente’s all-time points leader, Lindsey Pluimer, class of 2004, with 2,584. Other members of the 1,000-point club are Colleen Turnbull (1999), Kristen Riley (2007), Michelle Macintyre (1994), Sara Brown (2003) and Andrea Wertz (2007). The Tritons (14-9, 2-1) have won back-to-back league games and four of their past six. San Clemente finishes the first round of league play on Thursday, Jan. 17 at Trabuco Hills. The Tritons then play at reigning league champion Aliso Niguel on Saturday, Jan. 19 and host Dana Hills on Tuesday, Jan. 22. The San Clemente boys and girls wrestling teams each won Sea View League dual-meet titles, and the boys program won at the freshman, junior varsity and varsity levels to put the Tritons wrestling team back into the spotlight. San Clemente next grapples in the Coast View Athletic Association Finals on Saturday, Jan. 19 at Capistrano Valley High School. The CVAA is the group of schools that make up the South Coast and Sea View Leagues. The CIF-SS Dual Meet Championships are on Jan. 26 at Royal High School in Simi Valley, and the CIF-SS Individual Championships begin on Feb. 8 at Ayala High School in Chino Hills. The San Clemente girls soccer program had a challenging nonleague schedule, and things didn’t get any better when the Tritons dropped their league opener to perennial South Coast League rival Aliso Niguel, 3-0. However, the Tritons (6-5-2, 2-1) are back on track and over .500 with back-to-back league wins. San Clemente earned a win over San Juan Hills, 2-1, on a misty morning on Saturday, Jan. 12 and posted its fifth shutout of the season in a win over Tesoro, 1-0, on Monday, Jan. 15. The Tritons renew their local rivalry with Dana Hills on Thursday, Jan. 17, and will look to get even against Aliso Niguel on Tuesday, Jan. 22. Both games are at home.